Porsche Cayman GT4. Ford Mustang GT350R. Bentley Continental GT3-R. Mercedes-AMG GT S. Chevrolet Corvette Z06. Cadillac ATS-V. Dodge Viper ACR. Oh, and a (literally) flying Ferrari 488 GTB. One of these is Road & Track’s 2016 Performance Car of the Year. Which was the best? We’ve crowned a champion. 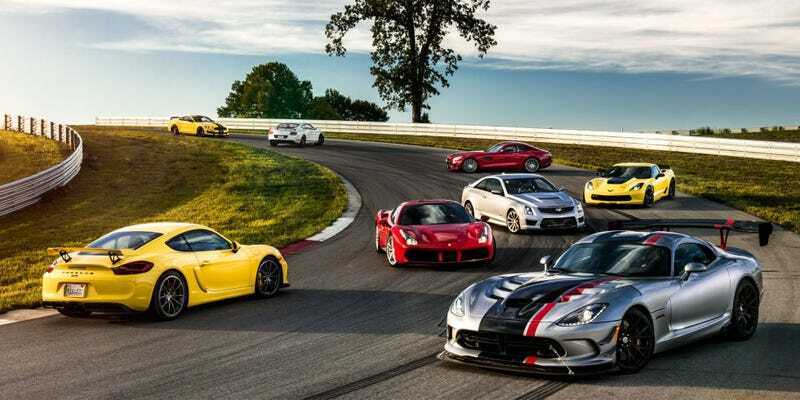 Every year, we gather the best performance cars on the market, and then we drive them on some of America’s best roads and pick a challenging track (which is why our magazine has the name that it does) in order to decide what car deserves our coveted PCOTY award. This year, the test went through Kentucky and Tennessee, ending up at the NCM Motorsports Park, which is spitting distance from the National Corvette Museum. Through three days of testing, we were able to determine an all around winner. Here’s how it went.